Discover a little piece of heaven on earth! 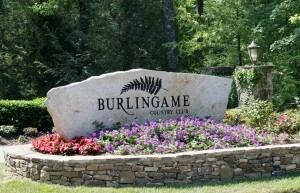 Burlingame at Sapphire Lakes, is an exquisite country club community located in the beautiful North Carolina Mountains. Homesites here are carefully chosen to provide beautiful mountain vistas, usable yard space and extensively landscaped lots between you and your neighbors. Burlingame offers endless recreational opportunities for you to enjoy. With a top ranked 18 hole golf course, tennis courts, fitness center, and a club house with heated pool. Natural ammenities abound in the area as well, from hiking to the tops of mountain peaks to trout fishing in the beautiful Horsepasture River. Burlingame Country Club is enveloped by breathtaking views of the mountains, the championship golf course is impeccably kept, and has the finest woods and water the area has to offer. Players of all abilities will find the course challenging with its winding streams and lakes. Tennis players will love the convenient location of the four fast-dry courts and one hard court. The fast dry courts are groomed daily for players and the tennis shop is open six days a week with merchandise and racquet restringing. Please email, or contact Jay Kaiser at Jay Cell (828) 421-0375 | Jewell Cell (828) 421-8376 - 515 N. Broad St., Suite 1, Brevard, NC 28712 -- to learn more about the Burlingame community.